Granite can teach men many lessons about fortitude and endurance, fire and ice, immediacy and eternity. 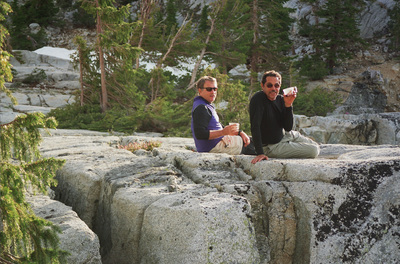 George and I began to learn new ones in the high country of Sequoia this summer: pace and gratitude. First, an amateur’s geological note about this teaching stone: The Earth’s crust floats on a ball of molten rock 8000 miles in diameter. One of the oldest rocks in the crust—familiar to hikers on every continent—is granite. Granite starts as a viscous igneous soup of quartz, feldspar, and other minerals deep beneath the crust…from Pluto’s realm…hence the geologic designation “plutonic.” When the pressure is great enough, perhaps as a tectonic plate squishes downwards, granite bulges upwards through a weak spot, intruding into the softer strata of the crust above like toothpaste into your suitcase. Then it slowly freezes and hardens forever…sometimes as massive domes like Yosemite’s monoliths and North Carolina’s Stone Mountain, sometimes as the fantasy lava lamp rockpiles in Joshua Tree and Anza Borrego, sometimes as sky piercing spires like the Torres del Paine in Patagonia. Mica and feldspar crystallize in different patterns, from gaudy to subtle. Different minerals contribute colors that can range from the pink of the Sawtooths in Idaho, to the tan of the California deserts, to the whites of the Trinity Alps, to some exotic greens and blacks in special places. Enduring millennia of freeze thaw cycles, huge granite faces will eventually crack and drop house-sized boulders onto ragged fields of talus below…never a great place to camp. Wind and rain don’t etch the surface noticeably, but glaciers can polish granite to a glistening shine. Boulders that find their way to a ravine will tumble and grate against each other until they round off their edges. Trout lurk in the shadows, and salmon spawn in the sand. While granite is the traditional favorite material for man-made monuments to themselves, the forms in nature are the ones that inspired them. While granite countertops have become fanciful for the modern kitchen, there is no greater beauty than ice water flowing over this stone in the wilderness. 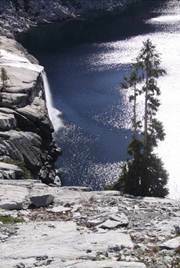 The stark beauty of granite in the wild can mask some serious hazards, of course. 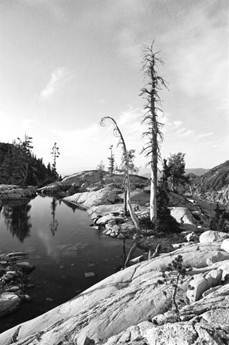 In Idaho in 1996, a tumbling granite boulder crushed my right ankle, considerably changing the complexion of the 7 remaining miles to the trailhead. 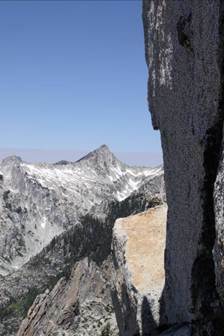 A few pulverized bones are a small price compared to what too many climbers have suffered when caught in the unforgiving crux of granite and gravity. I discovered the enchantment of granite in my thirties, when Robin and I sat upon the summit of Thompson Peak in the Trinity Alps. Shasta and Lassen jutted through crystalline air far away, glaciers scraped our flanks, and sapphire lakes sparkled in the clefts far below. I resolved never to wait a year to feel that good again. In the thirty years since then, I’ve undertaken more than 80 backpacking trips, accounting for somewhere between 400 and 500 days in the mountains…or the desert…or the North coast of California…but almost always treading upon granite. 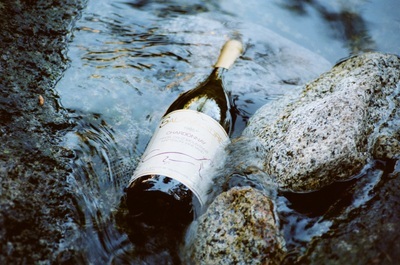 That granite will never show a trace of my footsteps, but my path in life has been defined by this extraordinary stone. George has also been hiking over granite ridgelines for an adult lifetime. He’s a former Cascades wilderness ranger, Humboldt surfer, Santa Cruz science teacher, and patient guide to human kindness. Our beards have become gray talismans of these decades of mystical surprises, bright moons, thundering water, cold plunges, and near misses in wild places. 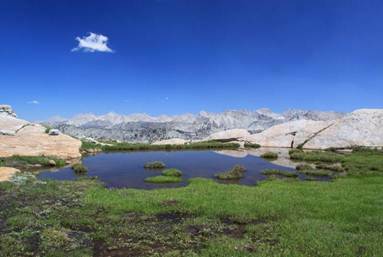 In August, we set out upon an ambitious weeklong trip into the high country of Sequoia National Park, familiar territory for George but unexposed granite for me. 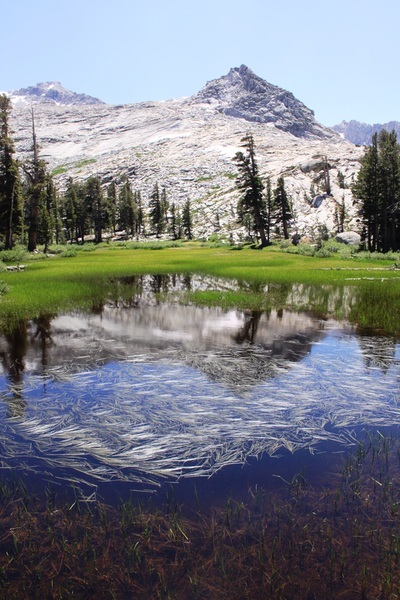 We planned to traverse 3 treeless passes, cover 50 miles, and ripple the surface of a dozen jeweled lakes. We discovered on our second day that we were no longer covering terrain like the old days. We were no slouches, but 10 miles off trail took longer than it used to. As the sun sank lower at our backs, we realized that our intermediate goal of Thunder-and-Lightning Pass was in reach. However, it seemed foolish to descend beyond the pass to our destination waterfall…now deep in the cold Eastern shadows below. Instead, we dropped our packs at the foot of a snowfield just below the saddle, took our icy baths in the last glints of sunshine, and watched the Western sky start to flirt with the Universe. High cirrus caught the refracted orange and tinged the rifts of snow in the amphitheater before us. A solar pillar dazzled our eyes, and eventually, the distant winking lights of Visalia mirrored the Southern constellations under Scorpio’s austere supervision. Instead of charging ahead to “catch up” with our itinerary the next day, we decided to stay high. We took a desultory romp along a series of ridgelines, realizing that our unfurling 360 degree Sierra panorama would delight John Muir or Galen Rowell…or Apollo. No rush. We eventually descended to the once unnamed lake, now “George’s Lake,” to let the day close in upon us. 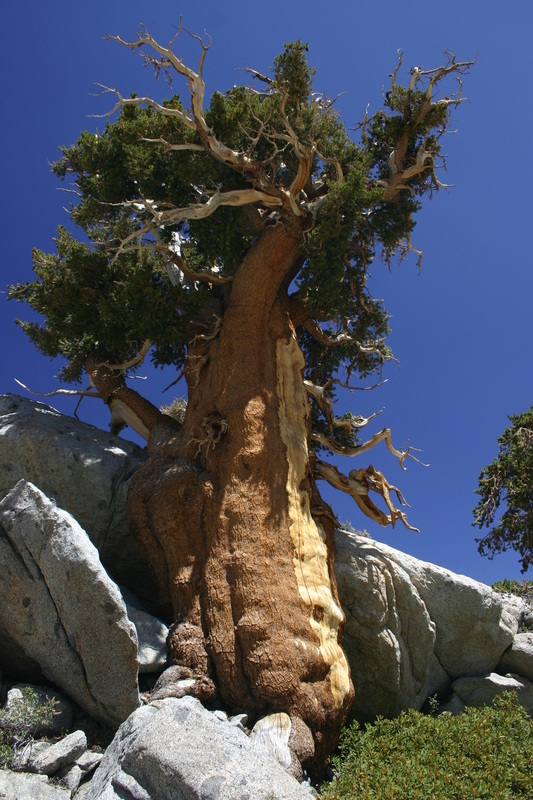 Perhaps my favorite plant in the mountains…if not the Earth…is the “Old Boy,” a foxtail pine growing above George’s Lake at around 10,500 feet. It’s more than 8 feet in diameter, growing out of a sheltering clutch of massive granite knobs. Considering the growth rate in that austere climate, I’m guessing it’s 2000 years old…pushing up into bristlecone longevity. We paid our tributes. The following day, after realizing that we were changing our formula for granite rapture from “passes conquered” to “marvels witnessed,” we set out for another isolated lake with a new sense of pace. 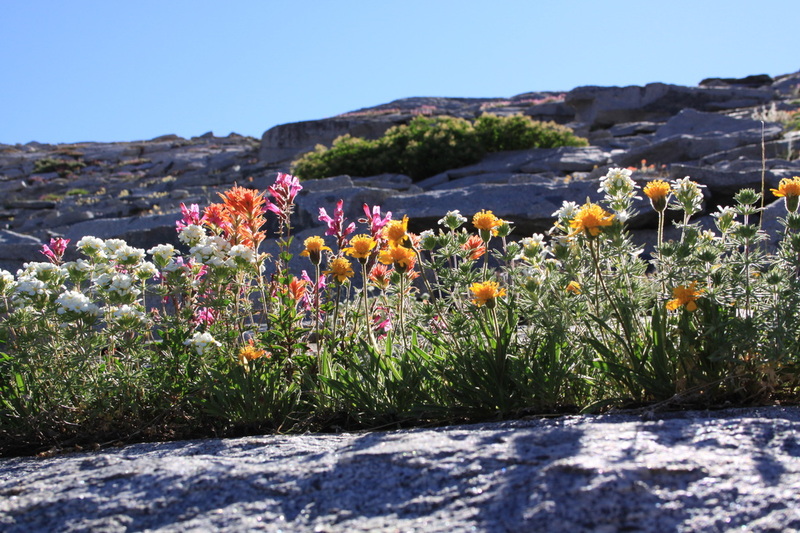 We waltzed through alpine gardens, drank from pristine freshets, glissaded down dimpled snowfields, splashed in emerald tarns, crept along crusted cornices, and watched the raptors glide high above our personal batholith. We were making steady progress in a long traverse when we saw an inviting notch where two ridges met above us. We accepted the invitation. When the grade flattened, we discovered a perfect Infinity Pool…azure blue as the sky above, with hundreds of granite peaks splayed out behind it. As we walked through the notch, we found ourselves standing on the intersection of three sharp ridgelines. Looking forward, one ridgeline extended due East for a hundred yards and then dropped abruptly a thousand feet…just like the granite ship’s prow of Gondor. We named it, naturally, the Gondor Salient. Silver streaks marked the watercourses of the valleys far below us, and clouds cast charcoal shadows upon the distant garden of granite spectacles. George the Ranger, of course, could identify most of the peaks. 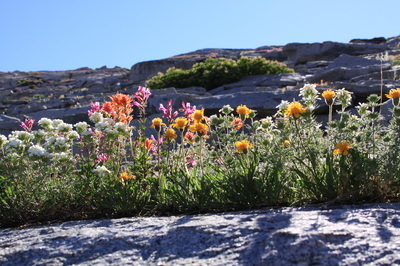 Lupines were popping between the boulders, while columbines and penstemons claimed the cracks. It was early in the afternoon, and our original lake destination was still achievable, but we decided to stay and watch the Earth-and-Sky show. We imagined that the Gondor Salient could experience some of the Sierra’s fiercest winds, not to mention electrical phenomena, but we enjoyed a perfectly windless night. We could stir the Milky Way with a gentle breath. Orion showed up late and relaxed…on his side. The dawn painted the white granite first dusty rose…then molten copper…then pure gold. We welcomed the enlightenment…and the coffee…and the chance to turn with the Earth instead of racing over it. We are not going to reclaim the athleticism of 3 or 4 decades ago, but we awoke in one of the most beautiful places in creation. The rest of our trip offered abundant sensory rewards of walking without urgency. I suspect we’ll keep this up for as many years as the granite will allow us to pass.